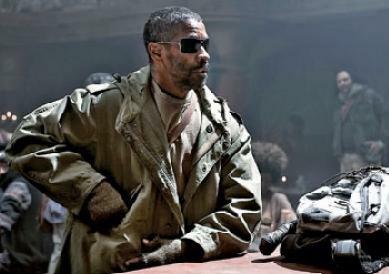 *This weekend, actor Denzel Washington will hit screens everywhere on a journey across a post-apocalyptic United States, protecting the last copy of a very important book – a very good book, if you will. The film is the story of a martial arts-skilled Eli, who is determined to protect the precious tome However, Gary Oldman’s Carnegie, a power hungry survivor who emerged as the ruler of the town, is determined to possess the precious item in hopes that it will wield a power to control the masses. Eli forges on as a stranger in a Western town – complete with saloon – in his quest, where his journey evolves into a deeper quest of living the words of the book instead of simply reading them. The Academy Award-winning actor said that the character’s evolution was one of the reasons he was attracted to the film. Washington explained that his character stumbles upon this town for a reason. “He could’ve gone around it and it would have been a whole different story. But in his spiritual evolution, this was a part of the process. He had to go down through the valley of the shadow of death,” he said. In addition to starring in the film and doing his own stunts, Washington is also a producer on the film and played a major role in building the script. Washington said that there were a lot of sessions with directors Allen and Albert Hughes as they went page by page creating ways to develop the story, written by Gary Whitta, for the big screen. That technique was confirmed by the Hughes duo, who said that they welcomed Washington’s script tweaking. Washington got involved in the film about three months after the Hughes brothers signed on. Before that, Warner Bros had a list of about 20 actors they proposed for the film. Allen said that he couldn’t imagine any other actor than Washington in the role. Directing duo the Hughes brothers told reporters that they were drawn to the script because of some particularly powerful words in the dialog. Furthermore, Albert Hughes said that the story resonates with what’s going on the world right now. “Somebody takes that book and wants to do bad with it and somebody takes it and wants to do good with it,” he said. The revelation is that the book is actually the bible although the first time the word ‘bible’ is used in the film is in its last five minutes. Washington, however, has no projections for the film’s message or what audiences should get out of it. “The Book of Eli” opens in theaters everywhere today. For more on the film, visit the movie’s website at http://thebookofeli.warnerbros.com.